Canada 2015. Day 21 (Aug 19, 2015). Limberlost was beautiful in the morning. There are only 12 sites in the campground so it is very quiet. We made coffee and popcorn and slowly got the bikes ready. We left the campground at around 9 am. I had planned a route from the Cascades to the Oregon Coast on roads that were new to us. I was particularly excited about riding Forest Service Road 19 or Aufderheide Drive, which is the southernmost portion of the West Cascades Scenic Byway. The road is named after Robert Aufderheide, who was the Willamette National Forest supervisor from 1954 to 1959. We took the NF-19 from OR-126, a few miles west of McKenzie Bridge. The road goes straight south towards the dam of Cougar Reservoir. We crossed over the dam to take some photos of this impressive structure filled with basalt rock from the cliffs in both sides. The 452-foot dam is the tallest rock-filled structure in Oregon. The level of the lake seemed very low to us even though it is supposed to be kept high during the summer months to allow for recreational activities. We continued south bordering the west side of the reservoir. At the end of the lake, NF-19 follows the South Fork of the McKenzie River for a while amongst beautiful tall Douglas firs and maples. This is one of the prettiest roads we have ridden on this trip. There was very little traffic and the woods were gorgeous. Unfortunately there was still quite a bit of smoke in the air. We briefly stop at the Box Canyon guard station where there is a replicate of a log cabin built by the Civilian Conservation Corps in 1933. Box Canyon represents the highest point on the road. From there the road goes down to cross and follow the North Fork of the Middle Fork of the Willamette River all the way to Westfir, OR. At Westfir we rode over the 180-foot Office Bridge, the longest covered bridge in Oregon. From Westfir we took Route 58 towards Eugene, OR. We wanted to avoid Interstate-5 so we turned south on Cloverdale Road in the direction of Creswell, OR, where we stop for gas. From Creswell we took Camas Swale Rd., Hamm Rd. and Territorial Highway to Lorane, OR. This was another pretty ride alternating between farms and woods. 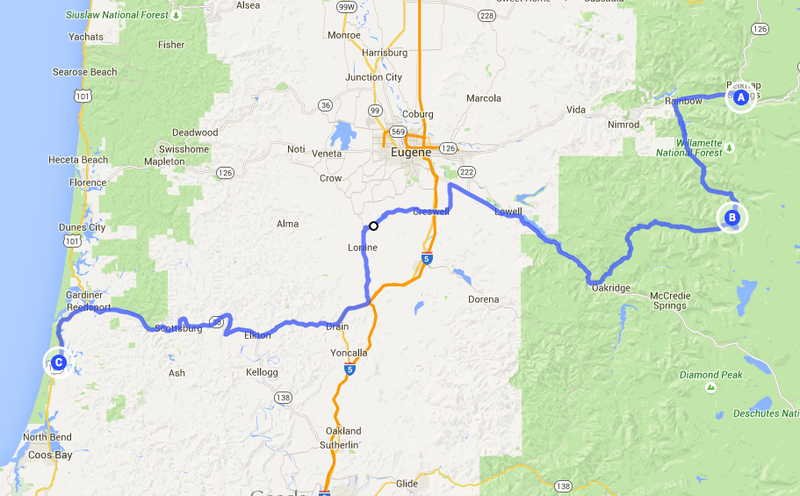 We continued south to Drain, OR, where we took OR-38, the Umpqua Highway, towards Reedsport. At Elkton, OR, we stop for a bite at Tomaselli’s Pastry Mill & Cafe. Adrián and I shared a delicious sandwich of salmon with a yummy wasabi-mayo dressing. From Elkton, Route 38 begins to follow the Umpqua River all the way to the Pacific Ocean. As the Umpqua gets closer to the Ocean, it grows in size, resembling a long skinny blue-green lake. Once we reached the Oregon Coast we rode south on US-101 and begun to look for a place to camp. This is the region of the huge Oregon Dunes, a favorite spot for people who love to ride ATVs (All Terrain Vehicles) and motorcycles on the sand. A few miles before North Bend we stumbled upon Eel Creek Campground where we found a campsite to spend the night. There was already firewood in the site so we had a nice fire that night. Unfortunately, the guy on the RV on the site next door to us run a loud Ryobi generator until 9:30 pm. I don’t understand why the National Forest Campgrounds allow generators to be run from 6 am to 10 pm. It seems excessive. Dinner time should be free of generator noise pollution. The quiet time for people (10 pm to 6 am) should be different from the time for generator use. For dinner we had a potato cheddar soup and kettle corn made with brown sugar. Once the stupid generator shut up we could here the ocean far away. When Adrián went to sleep, I stayed by the fire for a little longer. It was cloudy and cold.